The infamous Reverend Curtis Black's sordid past is no secret, as his wife, Charlotte, is well aware. But when Curtis' long-time mistress and mother of his illegitimate two-year-old, dies, he and Charlotte have no choice but to raise Curtina together. While the living, breathing reminder of her husband's infidelity infuriates Charlotte, Curtis couldn't be happier to finally have his whole family together. Despite her best efforts to keep her feelings hidden, Charlotte resents Curtina, taking her emotions out on the young girl. When confronted about her behavior Charlotte starts spending time away from home, all the while getting closer to her ex-boyfriend. Curtis appears to devote himself to his parish and the new church they're building, but is he really focusing his attention on the female parishioners trying to lure him into bed? Suddenly Curtis and Charlotte find themselves slipping into dangerous territory, and not even Curtis' seven-figure salary can prevent what is about to happen. 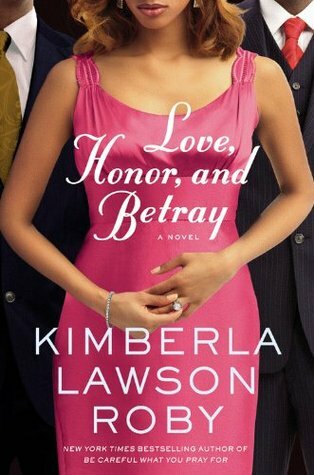 "Win your own copy of Love, Honor, and Betray by Kimberla Lawson Roby! @kimmie_1980 http://tinyurl.com/2vmgvct (01/16) #giveaway"
***Giveaway ends January 16th @ 11:59 ET!!!! I received a copy of the book from Hachette Book Group, in exchange for my honest opinion, and a review of my experience. I did not receive any other compensation or incentive nor was I required to write a positive review. Individual results or experiences may vary. I'd like to win because it looks like the type of books I like to read and I haven't read any of her books yet. I'm following on GFC with @headlessfowl. I love to read books from new authors and Roby's on the NYT Bestseller's list. checked out the author's site...I want to get this book because I love to read juicy chick lit!!! love to read books from new authors and Roby's on the NYT Bestseller's list, so would love to win! I follow you via google connect. I would love to win this book because I am an avid follower of the Curtis Black Series. I would love to get this book for my BF. It is her storey to a tee. I went to the site and remember reading her book BE CAREFUL WHAT YOU PRAY FOR and enjoyed it so would love a chance at this one. The author is a New York Times Bestselling Author but I've never read any of her books. I am curious!